Lagos Theatre Festival founded by British Council in 2013, is a festival to present performing arts from Nigeria and the UK every february in Lagos. It has a part focus on presenting site specific work. From Friday 28 February – Sunday 5 March 2017, over 500 artists will gather to present over 100 performances at 20 Venues, spanning 6 days. 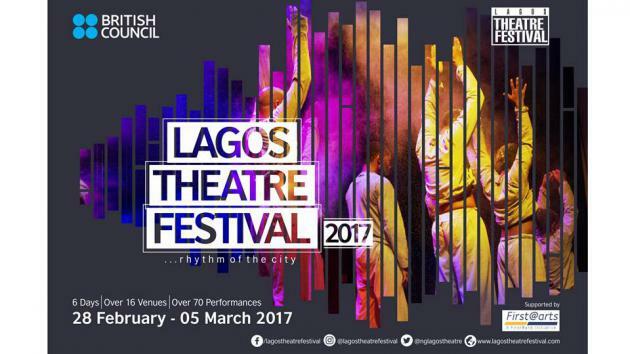 This edition of the Lagos Theatre Festival will be showing new work that will portray the rhythm, soul and sights of Lagos. The theme was selected to capture through performance, the sounds of Lagos expressed in the comings and goings, the repetitive activities and the music of the city. We hope to see work created that reflects specific auditory perspectives like noises, rhythm, beats, language, etc. from a range of socio economic and geographic groupings across Lagos. Like in 2016, the 2017 edition will have curated and fringe strands. The fringe is an open access festival for all genres in the performing arts (small theatre, children’s theatre, dance, film, spoken word, comedy, puppetry, cabaret, music and interdisciplinary arts) and is designed to allow performers/companies not participating in the curated festival an opportunity to present work for viewing, an excellent avenue to get involved in the Festival program, try out ideas and receive audience and delegate feedback but will be included in all promotional campaigns for the festival and in some cases will be programmed at venues. For more information and the programme visit the website.